The Whitecliffs divesite got its' name from the familiar looking cliffs of Whitecliffs, England. The northern end of the divesite features the namesake cliffs, while the southern end of the divesite has numerous bommies for exploration. This divesite also has some interesting caves in the wall. The south end of the divesite is a bit barren, although there are a few bommies in the shallows that make up for this. Sweetlips, featherstars, six-banded angelfish, and triggers are found around this shallow bommie. 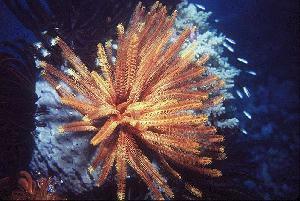 The middle of the divesite features numerous bommies with featherstars, giant clams, trumpetfish, and masses of coral. This area makes a good starting point for a dive. The northern end of the divesite features the namesake wall. On this end of the diveiste, bullrays, unicorn fish, and anemonies can be found. I have found that the best way to see the whitecliffs divesite is to start in a northerly direction, starting under the boat and visit the soft coral formation. From here proceed to the wall and visit the bottom of the wall and the caves. The end of the wall makes a good turnaround point. Swim back along the wall, shallower this time, to see the ginat clams, anemonies, and featherstars along the wall and wall floor. Following the wall until it becomes reef shelf begins a progressivley shallower dive allowing for a scenic safety stop on the bommie at the southern end of the divesite.